Rotterdamn’it went to Den Bosch to play the 3rd Outdoor Competition expecting a cold, gray and rainy day. The numbers did not look good to maintain our right to the 3rd Division. The previous evening the team was down to 7 players. At least 4 of these were going to start the day with injuries of some kind (not counting the bruises from the paintball session of the day before). It was then when Guang (usual pickup) came in and offered to play despite the weather forecast and other plans. That made our team Savage +1. And that sub will prove very relevant in two ways: because some players would need a rest at some point and because Guang played amazing. We went to the fields feeling like fighters of ‘El Alamo’ or ‘300’ ready to defend our ground in 3rd Division to the last breath. But unlike them we had no intention to ‘dine in hell’. 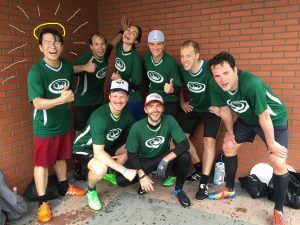 The first opponent was BeeFrisbee2’s. Coming from 4th Division and only other team having ladies in the roaster made them theoretically the most approachable opponent and the team to beat. We started the match with a quick lead of 5-0. From then on we traded points most of the game. Just in the end we were able to increase our gap to reach 15-6. With an initial victory and our clothes still dry we took shelter. The second match up was against Ultimaas. Coming from 2nd Division and looking strong and athletic they seemed too much power for us. But we jumped onto the field ready for the challenge. We managed to keep up against their zone and man defense to reach 7-8 behind and offense. During the recess our strength was starting to fade and the time still to be played seemed abysmal. It was in the second half that their dump pressure and fresher legs started to give them advantage. Our pep talks and very well engineered hydration mechanisms were not enough. Once we were 3 points behind our bodies gave up and we could not keep up with their cuts. They beat us 9-15, masquerading the great effort of the first half. The final opponent was Blue Spider Dogs (a combination of WAF, Blue Fingers and Vertigo) who again looked very masculine, experienced and athletic. We started a trench warfare in which we managed to get our points in offense and control their dangerous long game (our spies reported that hugs gave them their victory against Ultimaas). Our defense became a switching machine that constantly assimilated the gender mismatch getting an incredible amount of turns. We got to half time leading 8-7 and starting in offense. The fear of lowering the level on the second half as last game could be felt. But we kept on going to reach a short advantage of 13-12 under heavy rain. By then our clothes were heavy as lead and our legs ready to surrender. Some of our players were deciding who would stay in the field base on “the less injured” rule. In a point with many turns we had some misthrows and unnecessary drops that took us to 13-13, universe. In a decisive play in front of their endzone, Joep was running free into the break side, Oscar tried to throw an around break that was layout blocked in an impressive move by its mark. A quick counter attack gave BSD the victory. Beaten but very proud we huddled and shared “games like this is why we play ultimate” kind of comments under the rain. We later learned that having won the universe point would have made us the first of the group. Nevertheless, after a 3 way tight we remain in 3rd Division for last the competition day in Amsterdam. To all players: ‘Bravo’. Players ‘forgetting’ to sub when others needed it more. Arend, Vincent and Sander run in their cuts and defense until they could not move. Joep worked as a great experienced cutter. Vanessa and Rosa run an almost flawless handling game while Oscar did his thing around them. But all hats off for Guang who not only kept on running till the very end but used the rests between games to go to the cafeteria and work in his laptop. That is why Rotterdamn’it recognizes the great effort he made to help us in our hour of need and is giving him his highest honor, the medal to “his brother keeper and the finder of lost children” and naming him Saint Guang of Rotterdam. Thanks to all for this epic day!! In the early Sunday morning (when most Rotterdam’ers were still asleep) we started our one-hour journey to the first outdoor matches in the third division this year. Since everyone trusted Joep’s weather forecast of 95% rain chance, we packed a lot of changing clothes (except for Boris). So, we drove with two fully packed cars to Veenendaal, where we arrived in cold weather and were welcomed in a warm ‘sports cafeteria’ with some opera-like music, which did not help a lot with waking up. We started the first match against Vertigo 1, who were more difficult opponents than expected. Just before half time we were losing 8-3, but caught up to only a one point difference (11-10) in the second match half. Unfortunately, we could not keep the pressure and lost 15-10 in the end. Even though we were a bit disappointed, we were happy that it was sunny most of the time (Joep’s weather forecast was wrong!) and prepared some improved offense strategies for the upcoming match. During the break we boosted our bodies with some nice food, mostly with very nice chocolate-peanuts. Also the music in the room changed and was more energizing, although some of our team members, especially James, were still not entirely satisfied with it. 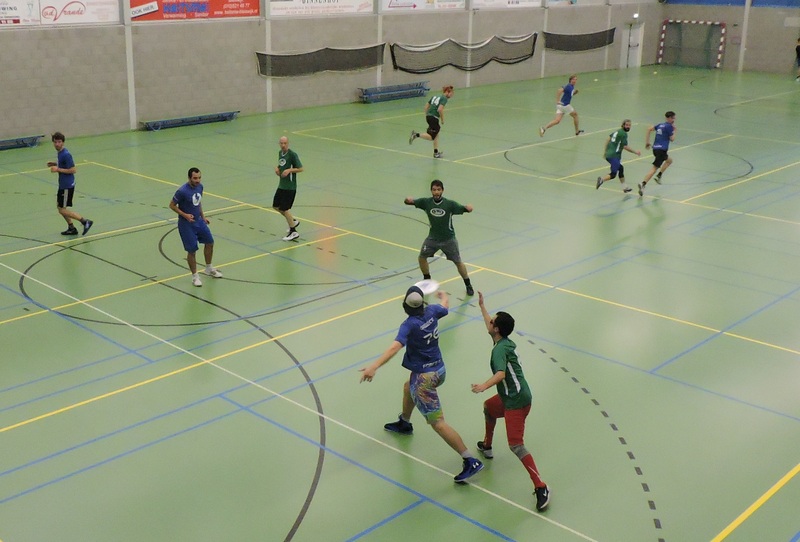 In the second match we played against the Veenendaal Tijgers. As expected they had a strong defence as well as tall and fast guys in the offense. This made the game already quite difficult and losing one of our players to a very important flight to the States after the first game did not help either, as we were then left with only one sub. Despite all this, we had some nicely played points with a good handler game and a strong defence. This was also influenced by the typical April weather: at some point during the game hail storms were causing less sight, but at the same time also more mistakes of the opponents. But even though we were able to win some points back, we still lost 15-4 in the end. The second break was quite long and everybody was almost asleep or just chilling. But the most important topic was the soccer game Feyenoord-Utrecht that started in the evening of the same day. Luckily the game started late, so we were able to get through Rotterdam without traffic and could still watch the game at home. Most importantly however, Feyenoord won and Rotterdam did not get trashed completely! The third and last match of the day was against UFO 2. After losing the first two games, the only possibility how to stay in the third division was by winning this game. The match was very nice and spirited with an attitude to play for playing’s sake and only some calls, which were valid. 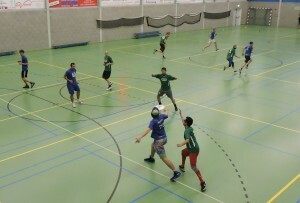 So the game was a lot enjoyed by both teams, especially by our team, since we won the first game of the whole day (15-9). However, we had one last important duty to fulfil after the game had ended: we needed to eliminate some confusion in the opponent team, because James is not Oscar, but James. Overall, we had a challenging but nice second outdoor match day. We ran a lot due to a little number of subs, the weather was sunnier and less rainy than expected and we were able to practice/improve some offense strategies as well as to adjust our defence to each single opponent team. And once more our team represented the women of the open outdoor competition, since we had the only two ladies on the line within the whole third division. Last Sunday on a very sunny pitch in Berkel-Enschot the first round in the 4th division of the outdoor competition 2015 kicked off. Everybody (14 frisbee fanatics) on time, coffee&cake, streched and properly warmed up. Ready for our first match against the organizing team Flying High. That warming up paid off. With a good offence and a pressure defence we took the lead by half time leading 7-1. Second half Flying High woke up and took some points back but not enough to get our victory in trouble. Ending in 11-5. After this strange double training month, starting Thursday October 23rd we are back to trainings on Thursdays from 19:00 to 21:00 in Sport Center WION. The joint team between Force Elektro and R’damnit went to the fields of Rijswijk last Sunday 15-09-13 to take on the third division. 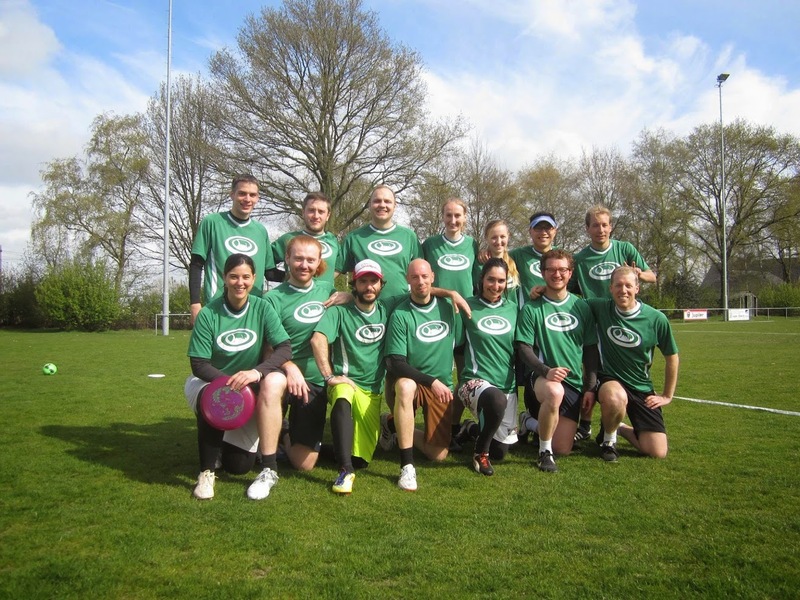 Our first match of the day was against Meer Ultimate Graag (MUG) from Haarlem. Sure, MUG has not been a club that long, but all their players were looking feisty and intimidating during their warm up, so we prepared ourselves for a fight. Our team had a good connection from the start of the match and took an early lead. Terrified that MUG would channel their inner champion at any minute we fought on. Our wariness proved founded after a three point run by MUG. Luckily we were able to shut them down once more and took victory with an impressive 15-5 victory. Our second match was against the organizing team of Ultimus Prime. Given the friendly rivalry between FE and UP, we were once again ready for a serious match from point 1. UP was missing some of their strong players but still put on one hell of a fight. At half time many of us were genuinely surprised to see that we had an 0-8 lead… that couldn’t be right. Trying to rest our poor 5 guys (we had to play each match with only 3 women on the line), we set up both a confining zone and a trap zone on alternating points. Although the confining zone had some success, our trap zone was a small disaster given the lack of wind and our lack of practice at that particular zone. Despite the toll on our energy (at least for the women) the zone took, we still managed to maintain our lead and took the win at 15-3. We prepared for our match against UTKA by watching the exciting (and lengthy) end of the MUG-UTKA match. UTKA took that match 14-13 on universe point and had us quaking in our football boots with their speed and fighting spirit. We therefore entered our match against UTKA somewhat nervous but full of focus wanting to deny them everything from the get and go and to maybe exploit the fact that they were tired… surely they must have been tired after their match against MUG. There was luck on both sides with some awesome garbage scores and catches by UTKA but we got a few close calls in there as well. Our extra energy and focus proved decisive and we managed to secure another victory with 15-6. With three victories under our invisible belts we secured a promotion back up to the second division. Lets hope we fare better up there this time around. On the first of September the combination team of Force Elektro and R’damnit went to Arnhem to take on the rest of the second division. Arriving there around 10 in the morning we were soon to face the reality of the day, many many skilled ulitimate players. The day started out with our match against GD. After several points of amazingly good team play, perhaps shocked to be winning, we fell apart a little and GD took the lead. Although we became more competitive once more following halftime, but GD had already run away with the lead and continued to play solid ultimate, leading them to a 15-7 victory. Our next battle was against the host team: Airborn. again we took an early lead, and again we lost it. But there followed a very intense fight after that, which we emerged victorious: 12-10. After some more healthy snacks and chatter we faced Crunch 2. They had won both their matches so far withe a pretty 15-10. Following a very mixed match (both in terms of gender and strategy) which brought out our best fight, we managed a 15-11 loss. It was a tough day in the second division, we fought hard, had a good day´s worth of ultimate and a nice beer or two at the end. Unfortunately we demoted to the third division. Sunday 07-07-2013 we have been competing in the Hargen Beach Tournament. We won’t take about the first day, this day was used to warm-up. So the second day was a new beginning of the tournament where we will show that R’damnit is growing each day. See some awesome attached action photo’s for your self.